As Rochambeau begins to move around the space, her movement is fluid, circular and non-ending. Rochambeau shapes the piece as a creature “in search of an inexhaustible fertile land, a race driven by survival towards time and flesh emerges at the risk of losing oneself in the excess of our thirst and desires.” Although I am not sure this was achieved in the performance, I did enjoy the beautiful work. 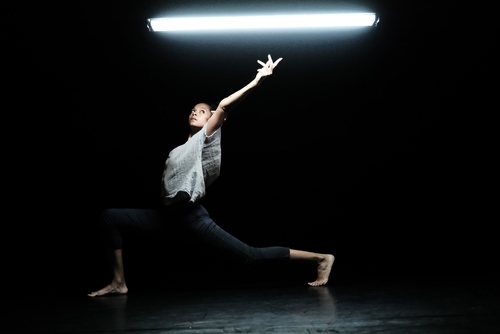 Following is On Notice, choreographed by Davida Monk and performed by Rufi Oswaldo. The piece is similar in feel to the last, however, it’s distinct in movement quality. Oswaldo emerges dressed in black and feathers, with a black stripe of makeup across his eyes. In this creature’s world, the movement is clean, quick and quirky. The small details such as the sharp tilts of the head from side to side give a glimpse into the world of a solitary, intense and expressive crow; an intelligent, honest and embodied creature. The work proposes the question, what might a crow teach humanity about living? The second half of the show presents three shorter works; Ellipses, a hypnotic female trio choreographed by Montreal’s Stefania Skoryna with a beautiful original score by Olivier Alary. El Encuentro (The Meeting), is a collaborative flamenco piece with a vocalist, dancer, violinist and guitarist. You can feel the passion and connection between the performers in this creative exchange, improvised in a highly structured form. As We Are, is choreographed by Toronto’s Kirsten Sullivan in collaboration with her performance partner Connor Mitton. The duet presents an intimate, intricate and highly physical piece. The dancers push, pull, grab and flip each other all over the space. Continuously switching dominance in an interlinking battle to a cover of Nirvana’s “Come as You Are.” This full force piece was my highlight of the show as the dancers exchange moments of defeat and support. Series 3 – Into the Fire is a strong finish for the company’s thirteenth season. Next season brings significant changes as they leave there home at the Pia Bouman School. The building has been sold, and Dance Matters will continue as part of The Citadel’s performance series in November. Make sure to follow Dance Matter’s on social media to keep up with this company that continues to support the dance community in presenting new and highly physical Canadian dance works. Photo of Anne-Flore de Rochambeau, by David Wong.